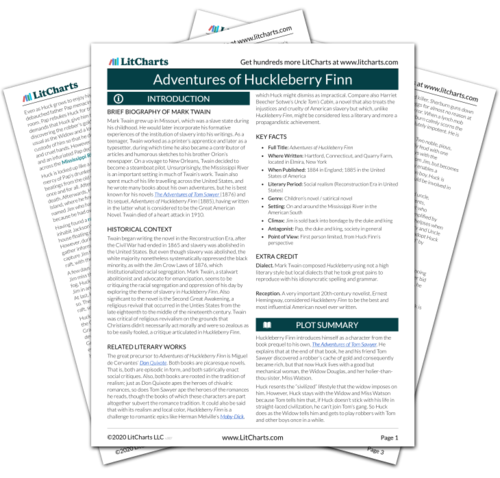 Instant downloads of all 946 LitChart PDFs (including The Adventures of Huckleberry Finn). 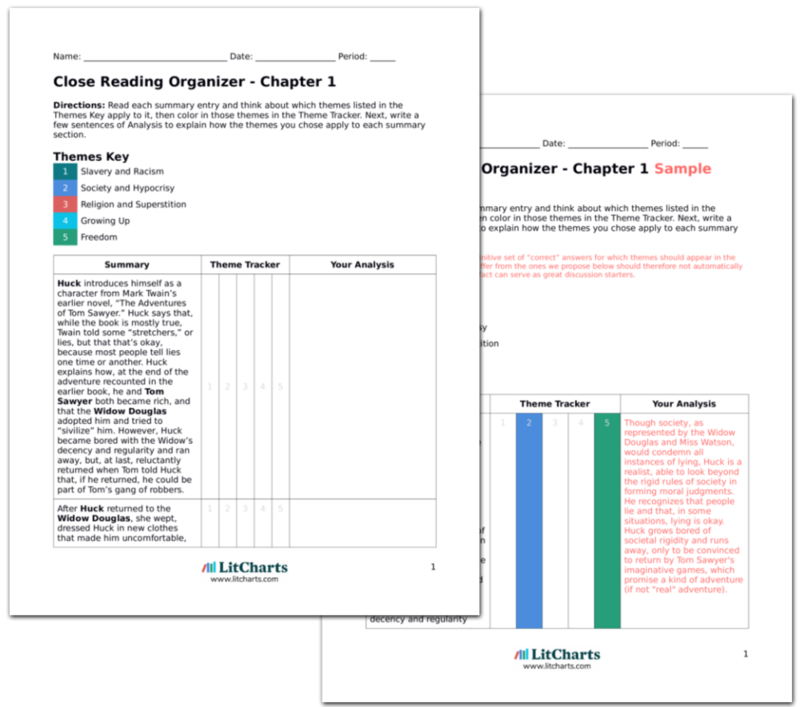 LitCharts assigns a color and icon to each theme in The Adventures of Huckleberry Finn, which you can use to track the themes throughout the work. The next day, Huck and Jim enjoy the things they found in the robbers’ skiff, and Huck describes the night before as an “adventure.” But Jim says he doesn’t want any more adventures, because he could have easily drowned or been captured and returned to slavery. Huck concludes Jim has “an uncommon level head” for a black person. Jim’s realist interpretation of the night’s events convinces Huck that avoiding dangers in the future is reasonable. This is a maturation in terms of his pragmatism, but also in his regard for Jim, whose intelligence he prejudicially dismissed before. Huck reads to Jim about kings and noblemen. Huck explains that kings get whatever they want and go to war and “hang round the harem” where they keep their multiple wives. Huck and Jim then discuss King Solomon, whom Jim accuses of being a fool for wanting to chop a baby in two. Huck tells Jim he’s missed the point, but Jim says the deeper point is this: that a man with few children thinks of children as precious, but a man with many children, like Solomon, thinks of children as being expendable as cats. Huck thinks that Jim is being stubborn, but changes the subject to other kings. In addition to foreshadowing Huck and Jim’s adventures with the duke and king, this passage provides Jim’s critique of wealth as expressed in his critique of Solomon: he thinks that people with little cherish what they have all the more, whereas those with surplus devalue what they have. In addition, Jim here criticizes a Biblical hero as being a fool on the grounds that he is not caring enough, and while Jim may be missing the point he is also not entirely wrong, either. Huck tells Jim about Louis XVI and his young son, who was jailed after his father’s execution. Jim feels sorry for the little prince, and Huck replies that some people think he escaped and came to America. Jim is pleased, but imagines that he must be lonely, given that there are no other kings in America. Huck says that the prince could join the police force or teach French. Jim doesn’t understand: don’t all people speak the same language, he asks. Huck says no, and gives an argument for why that is so, but Jim pokes a hole in the argument, such that Huck is forced to conclude, “It warn’t no use wasting words.” Both Huck and Jim fall silent. Europe is represented here as a place of feudal brutality; America, as a refuge for the free, like the prince. Huck is right, of course, that not all people speak the same language, but Jim poses a valid logical argument to which Huck can’t respond, indicating that while Jim may be ignorant about the world his reasoning ability is at least Huck’s equal. When Huck says he won’t waste words responding, it’s both because he doesn’t have a response and because, though he thinks Jim reasonable, he is still prejudicially dismissive of Jim. Wilson, Joshua. "The Adventures of Huckleberry Finn Chapter 14." LitCharts. LitCharts LLC, 19 Sep 2013. Web. 9 Apr 2019. Wilson, Joshua. "The Adventures of Huckleberry Finn Chapter 14." LitCharts LLC, September 19, 2013. Retrieved April 9, 2019. https://www.litcharts.com/lit/the-adventures-of-huckleberry-finn/chapter-14.